Will Self, whom the Los Angeles Times calls the hottest young novelist in England," demonstrates his razor-sharp wit in these nine new stories. Self's method depends upon taking an ordinary aspect of the world and then pushing it to its limit in furious absurdity. 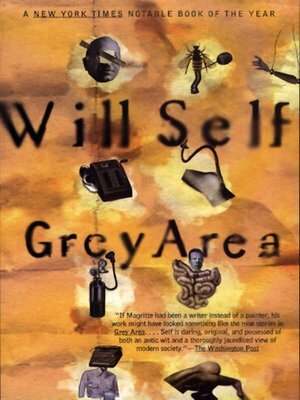 The short stories in Grey Area reflect the technical brilliance and satiric voice that have made him one of the most highly praised comic writers in a decade. These are stories that delve into the modern psyche with unsettling and darkly satiric results. Inclusion®" tells the story of a doctor who is illegally testing a new antidepressant made from bee excrement. A Short History of the English Novel" brings us face to face with a pompous publisher who is greeted at every turn by countless rejected authors. In The End of the Relationship" a woman who has been left by her boyfriend provokes—like some emotional Typhoid Mary"—that same reaction among all the couples she goes to for comfort. The narrator of Between the Conceits" declares without hesitation that London is controlled by only eight individuals, and, thankfully, he is one of them. Self's world in these pieces is both curiously familiar and hauntingly strange.